3 in 1, can be used as a potty, soft trainer seat with handles and booster step all in one! This set is a high quality robust potty system that grows with your child. Suitable from 18 months approx. It's a potty that grows with your child. It is a Potty, booster step, and universal soft toilet adaptor / trainer with handles - all in one! It’s practical, hygienic and easy to clean. Also its removable tank makes it far easier to clean. Comfortable for the baby because it is ergonomically shaped and padded. 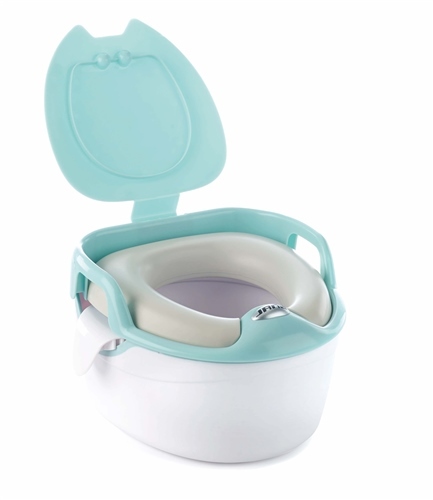 It has a raised area on the padded toilet trainer seat that’s specially designed for little boys, to help keep them from sprinkling everywhere! Booster step helps your child reach the toilet and wash hand basin. It has non-slip base that keeps the booster step stable when child stands on it. Potty has a liquid sensor that activates the music when the child uses it correctly. Helps to educate your child and also makes potty training fun. Really high quality item, has rounded corners and made from top quality robust materials. MEASUREMENTS: Long: 30cm, Wide: 30cm, High: 21cm.